In recent decades, many shark populations have been decimated by overfishing. Often this is the result of those looking to make a buck off the gruesome process of shark finning—which involves bringing a shark on board a boat, slicing off its fins, and tossing it back into the sea and to certain death. But according to some conservationists, a new effort to help ailing shark populations by banning the sale of shark fin products is misguided and could actually harm sustainable shark fisheries. The practice of shark finning has been illegal in the U.S. since 1993, but members of Congress are still working to solve the problem as there are ways of circumnavigating the ban, which addresses the act of shark finning but not the buying and selling of shark fin products. It’s estimated that as many as 73 million sharks end up in the global fin market every year, a trade fueled by the demand for shark fin soup primarily in Asian markets, but also in specialty American Chinese restaurants. In March, Senator Cory Booker (D-NJ) and Shelley Moore Capito (R-W.VA) introduced the Shark Fin Elimination Act, which proposes to make it “illegal to possess, buy, sell, or transport shark fins or any product containing shark fins.” The legislation is also backed by fellow senators like John McCain (R-AZ) and James Inhofe (R-OK), and has a sister bill in the House filed by Rep. Edward Royce (R-CA). Although a similar bill died in Congress last year, the bipartisan nature leaves many supporters optimistic for the bill’s future. “This is an opportunity for the United States to continue to be a leader on shark conservation issues by shutting down the domestic trade in shark fins,” Booker’s office told Earther. 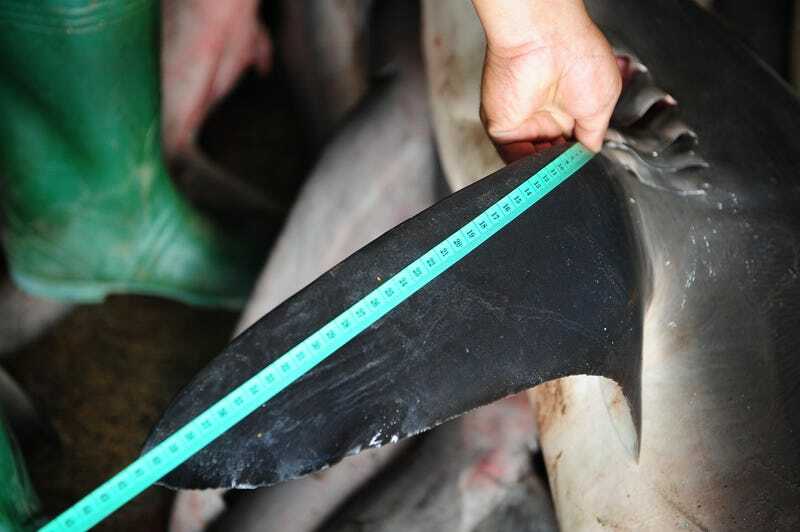 More than 100 scientist have voiced their support for the Act, stating that while shark finning in the U.S. is illegal, removing and selling fins once a shark is landed in port still perpetuates the global trade. But not everyone agrees on the merits of the legislation. A new paper published by Dr. David Shiffman and Dr. Robert Hueter in the journal Marine Policy argues that although the goal of the Act is laudable, the policy is misguided. As outlined by the new paper, the legislation could undermine the progress made to ensure sustainable shark fisheries that use fins can prosper domestically and internationally. The researchers argue that the proposed legislation also oversimplifies the threats facing sharks worldwide, reducing the problem to simply the demand for shark fin soup. Hueter noted that a key misconception in with the Act lies in the definition of finning itself: Shark finning is not the same as shark fishing. Shark finning has been illegal in the U.S. for over 20 years, but if a shark carcass is brought back to port with the fins still attached, that shark has not been finned even if the fins are later removed and sold. Shiffman and Hueter noted that the global fin trade is declining, with total world imports and exports dropping 18% from 2003 to 2011. However, the global trade in shark meat is rising; a 42% increase from 2003 to 2011. The National Marine Fisheries Service reported that the total value of shark meat in the United States netted $3.3 million in 2014, while shark fins removed from sharks caught in the same legal fisheries earned $1 million. As noted by Shiffman and Hueter, this means that the proposed ban would eliminate 23% of the value of legally caught sharks, which could cause economic harm to to local communities and rule-abiding fishermen. This being said, Hueter notes that one can’t criticize such a conservation proposal without offering up a suggestion for how to reduce illegal and unsustainable finning. He suggested some solutions to improve already existing management strategies to help maintain the U.S. as a global standard for shark fisheries management. On one end, he advocates for increased penalties for those who fin illegally, as well as increased education on sharks and shark fishing. Most notably, however, is what he calls the Sustainable Shark Trade Act of 2017. This act doesn’t ban the sale, possession or trade of fins, but instead it goes after the import of shark products from countries that do not have sustainable shark fisheries or policies. Hueter hopes this would help increase the traceability of fins, and ensure that any fins sold in the United States were sustainably caught and processed within the country. Alexandra Malloy is freelancer and works with topics surrounding the environment and animal welfare.